The Philips Hue Starter kit ($199) contains three bulbs and a hub for controlling the lights. Hue is a connected wireless lighting system from leading light bulb manufacturer Philips. Connected to your home's Wi-Fi, Hue lights can be controlled via a smartphone or tablet, or with a special switch. With tunable white light and a full spectrum of color, you can set the perfect mood in your home with the touch of a button. There has been an influx of connected lighting to the smart home market in 2014, and Hue is the leading color-changing bulb on the market, capable of producing up to 16 million color combinations. Additionally, Philips opened its API, allowing developers to create all sorts of apps that use Hue in ingenious ways. Currently, a starter pack (which includes a hub for controlling the bulbs) is $199. Each hub will work with up to 50 bulbs, and you can purchase extra bulbs for $60 (for color changing) or $30 for just white light. How is this beneficial to a family? First, it's a lot of fun! There are apps that can turn your lights into a disco party, flash when your team scores a touchdown or turn your living room into the colors of the Amazon rain forest. We had a lot of fun with the Hue Xmas app, which integrates festive pulse lighting with Santa sounds, reindeer hooves or children singing carols. 6:15 a.m.: Using the app that comes with Philips Hue, program the lights in your child's room to turn on at 30% to start gently waking them up. 6:30 a.m.: At wake-up time, have the lights turn to full brightness. If you have a very deep sleeper, set the lights to “disco party”—the flashing red, blue and green can be a very energetic motivating way to wake up! Within the app you can set the alarm to only activate on weekdays—so no chance of Junior waking up when he doesn't have to be. 7:30 a.m.: To avoid that futile constant checking of the clock in the morning, program the kitchen lights to flash when it's time to leave to catch the bus. Pro tip: Using a free service called If This Then That (IFTTT), you can set up a rain alert. This will turn a chosen light or lights (say the hallway ones), blue if it's raining outside, helping avoid the inevitable dash back in after you step outside. When the lights turn red in our household it means it's time to go upstairs to bed. 6:30 pm: An hour before bedtime, program all the lights in your house to dim to 30%. Then have the lights in the room you'll probably be in (such as the living room) turn to the pre-set Relax mode. This will help everyone start to wind down. It's only once you've experienced the impact of lighting on your mood that you truly understand its benefits, but in our household simply changing the color of the lights has had a dramatic impact on our children's behavior. You can set up your own "Scenes" in the Hue app to suit your family best, if green is a very relaxing color for you, you can bathe your living room in an emerald glow at 6:30 p.m. every night. 7:30 p.m.: Once everyone has been calm for a little while, have certain lights flash red when it's time to go upstairs to bed. This "other power" telling the children it's time to go to bed is surprisingly effective, certainly more so than mommy or daddy's voice. At the same time your living room lights flash for bedtime, have the lights in your child's room set to "reading" mode. Put this on a timer in the Hue app— say, 30 minutes—so they turn off when it's time to sleep (of course, you can override any of these features with your smartphone if you want to read one more book). 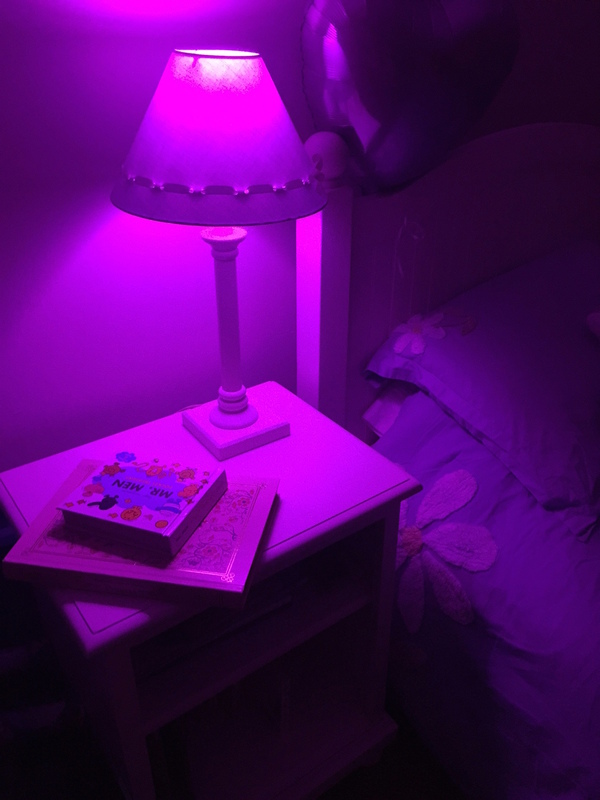 Purple dimmed to 10% makes a great nightlight for a child. To Check On Your Child: Set up a motion sensor (such as the Belkin WeMo) and pair it with a light in your child's room via IFTTT. Then set the sensor to turn on the light to 10% red when the door is opened between 10 p.m. and 5 a.m., and stay on for 5 minutes, so you can check on your child without waking them. Hallway Safety Light: If you have a child that often gets out of bed at night, set the hallway light to come on dim around midnight and stay that way until morning. Alternatively, set up a motion sensor that activates the hallway and bathroom light when they open their bedroom door. Stop / Go Light: If you have an early riser on weekends, use Hue as a stop/go light. Set one light in the room to turn to a dim red around the time your child usually gets up, then have it turn bright green at the time it's OK to get out of bed and come visit you. Our daughter knows that she can't get out of bed in the morning until her bedside lamp turns green. The combination of sensors, smart lights and a little bit of parental ingenuity can turn Philips Hue, or any smart lighting system, into an indispensable part of your family's daily routine. As every parent knows, scheduling a routine (and actually sticking to it) is one of the hardest parts of the job. Jennifer Tuohy, a mom of two and gadget lover, gives advice on how to use technology to make your family life easier. The Home Depot selection of LED lights, including the Hue bulbs that Jennifer talks about in this article, can be found in their stores and online.